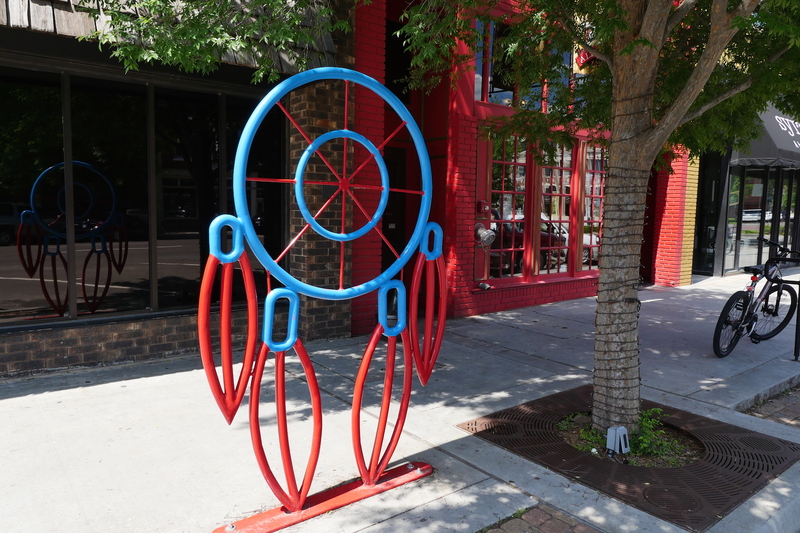 Art in public places adds character, life, and inspiration and Downtown Norman is home to some fantastic collection of public art displays. Below are eight of them worth seeing in person. 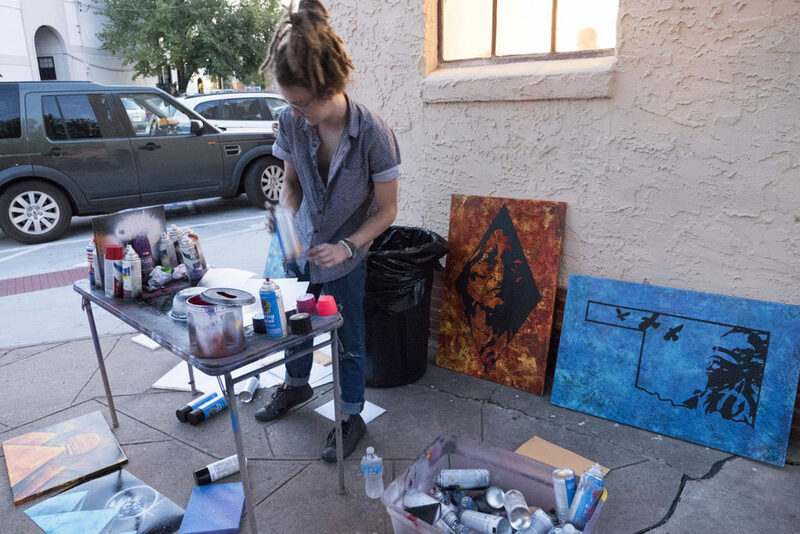 To experience the overall splendor of the downtown, come during the 2nd Friday Norman Art Walk, held on the Second Friday of each month. 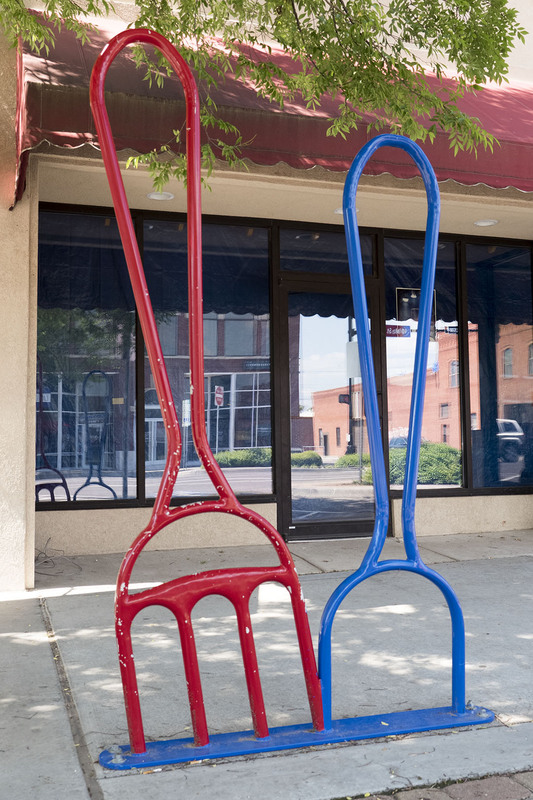 I personally love art that’s interactive or functional, which these creative bike racks fall into the latter. Designed by various people, there are other designs including a dreamcatcher, fork and spoon, and more. And yes, you are allowed to lock your bike to them. Committed by Denny Haskew can be seen outside The Crucible Foundry, which is north of Sooner Theatre. The Crucible has a whole gallery and sculpture garden worth seeing too. 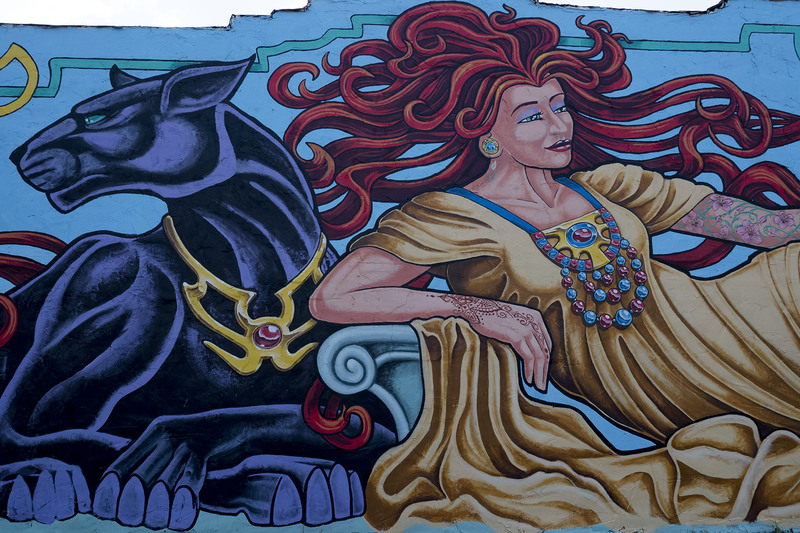 Written and Directed by Derek Vosten of Hall of Tattoos, this mural can been found east end of Main Street along Porter. 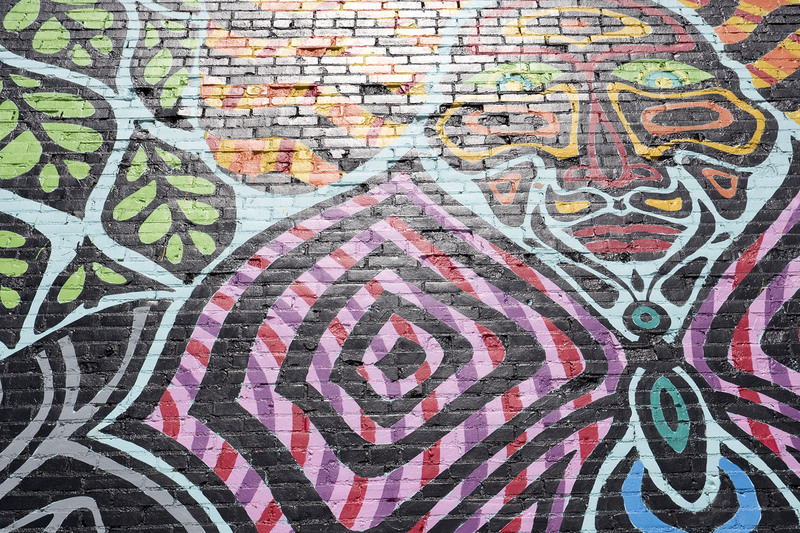 The mural was produced by Dreamer Concepts and Hall of Tattoos. The sculpture in Norman came about from a call for entries with specific request to be Oklahoma themed. 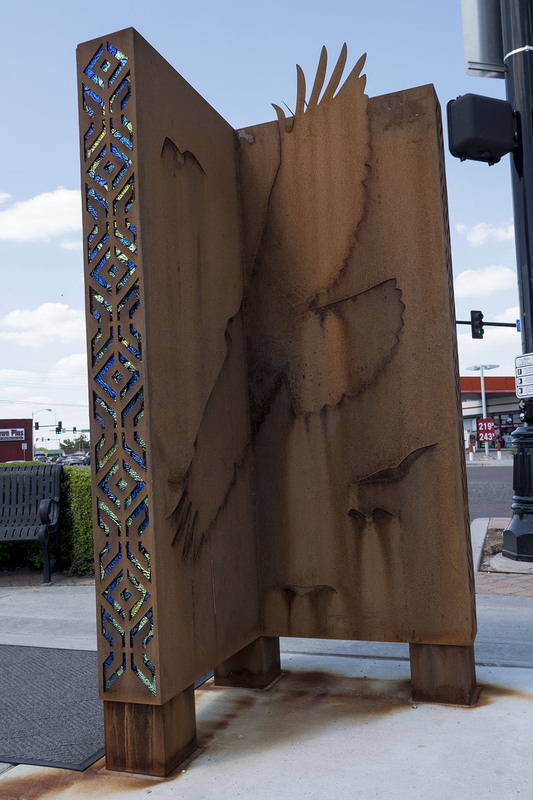 On one side is larger than life wheat imagery and the other has the red tailed hawk, then on each end is a tribal like graphic, which is not tribe specific. The sculpture is made from cor-ten steel. It’s steel that is made to rust and the rust actually seals the metal from further corrosion. Rick said glass is a not a good medium for outdoor public art, however, they did come up with some unique ways to include glass. The ends with the design have dichroic glass placed behind the cut out metal, and adhered to a metal surface like you would mosaic tile. Even though the material is fragile, once it is stuck down to a solid surface, it would take a hammer to break it, and in this case, with it behind a pierced layer of steel, almost impossible to break. White Tracey and Rick worked at their day jobs, from start to install was about six weeks. 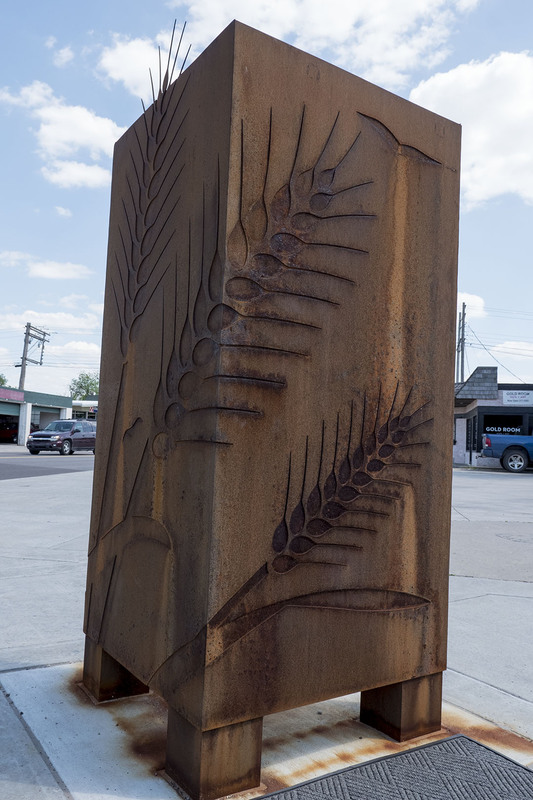 Three Days by Rick Sinnett can be seen next to STASH on Main Street across from the fire station. Rick’s been painting murals all over Route 66 and Oklahoma, including the one for Rocktown Gym in Oklahoma City. The Three Days mural took about two weeks with the help of funds donated and artwork sold at STASH. He originally drew the piece 15 years ago. 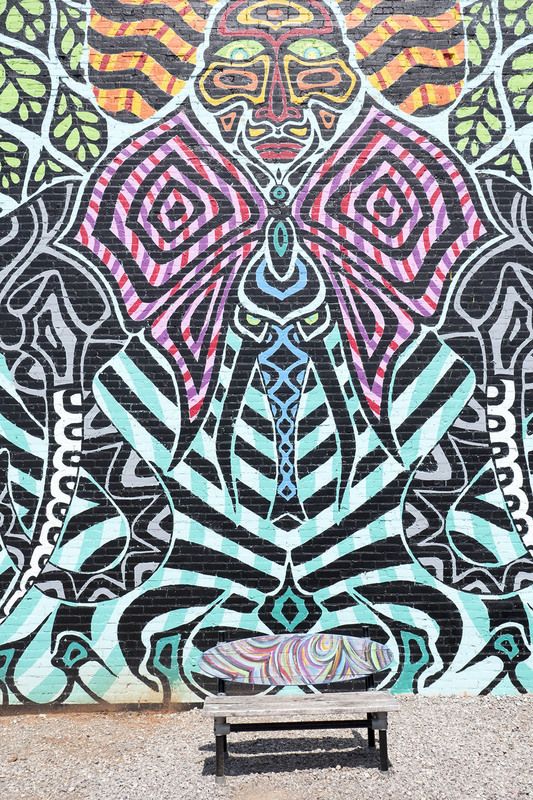 The inspiration came from countryside visit where wondered what Oklahoma was like ages ago and he pictured Mastodons, which is the animal featured in the mural, roaming the plains. 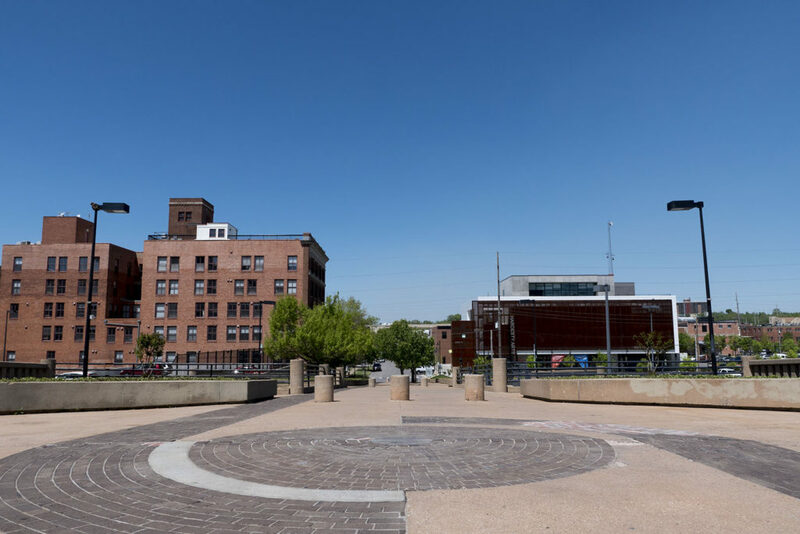 Rick was was born and raised in Oklahoma and whatever he creates tend to have Oklahoman ties, however, Three Days visual direct connection to Oklahoma isn’t apparent until you learn about it. 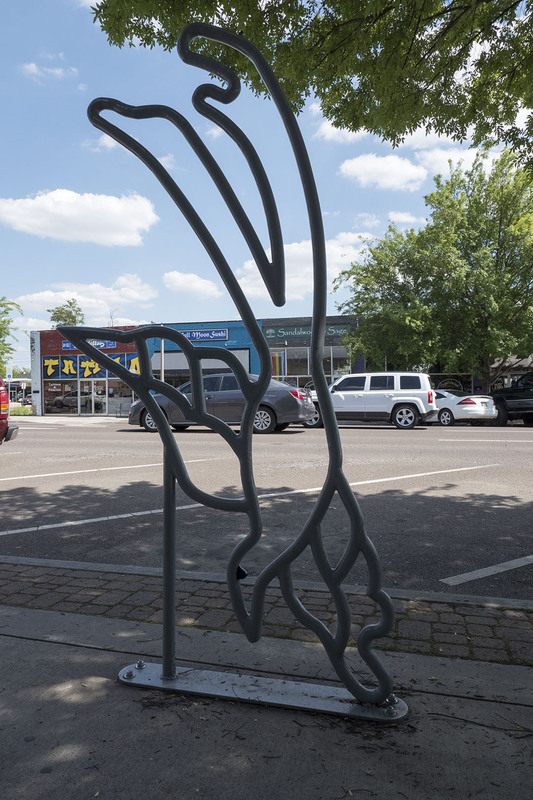 For art that’s historic, the The Heart of Norman series of murals by Dr. Bob Palmer can be found in a parking lot along E. Gray street between N. Peters and N. Crawford. 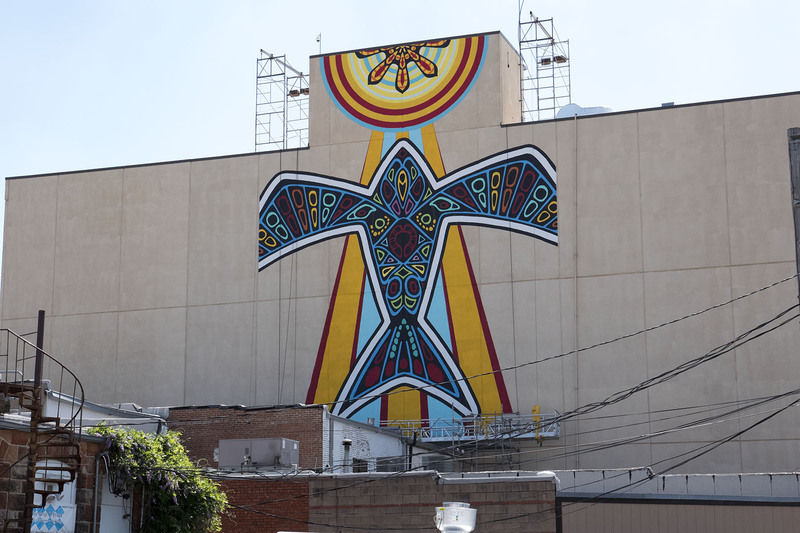 Another work by Rick Sinnett, the Norman Red-tail Hawk Mural was already worth checking out when in was a work-in-progress. It can be seen along the north side of Main Street. You’ll have to look high for it! 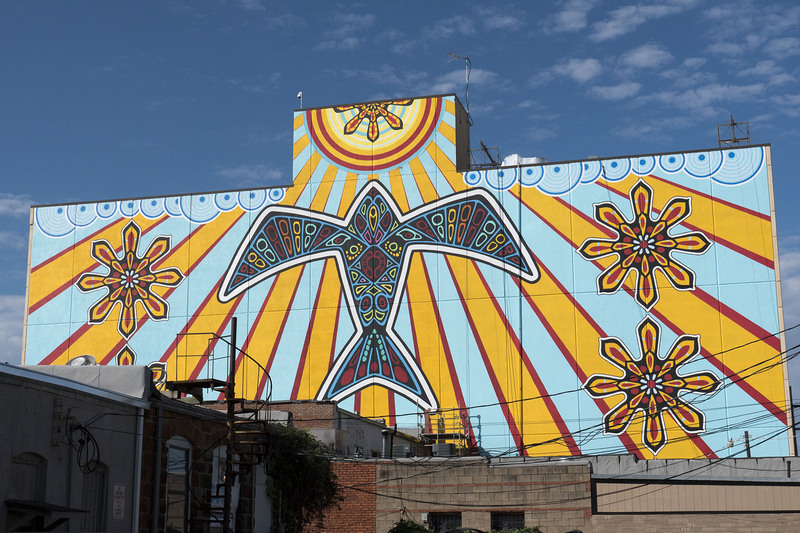 The inspiration for this mural came from Rick’s childhood growing up watching red-tail hawks. As the sunbeams radiate outward, on each side there will be three giant Indian Blanket Flowers (Gaillardia pulchella), which is the Oklahoma State Wildflower. 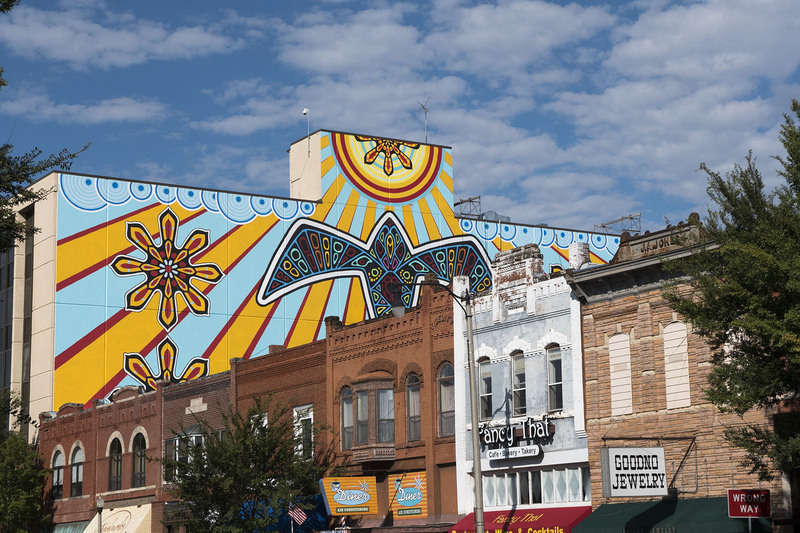 While the mural can be seen from Main Street, seeing it along Gray Street reveals its full scope. Take the Legacy Trail south from Main street, along S. Jones Ave. to find this historic metal miniature replica of the OU campus years ago. 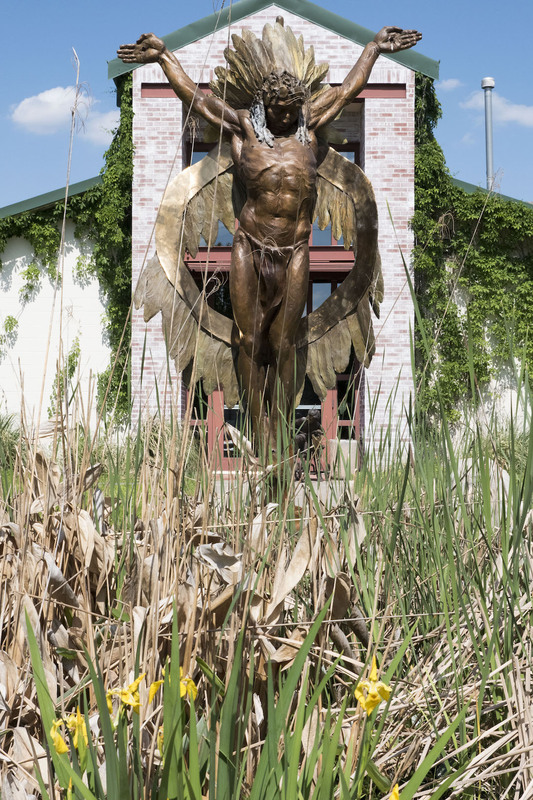 Legacy Trail holds even more sculptures and historic pieces. Above was only a sample of the public art worth seeing in Downtown Norman. 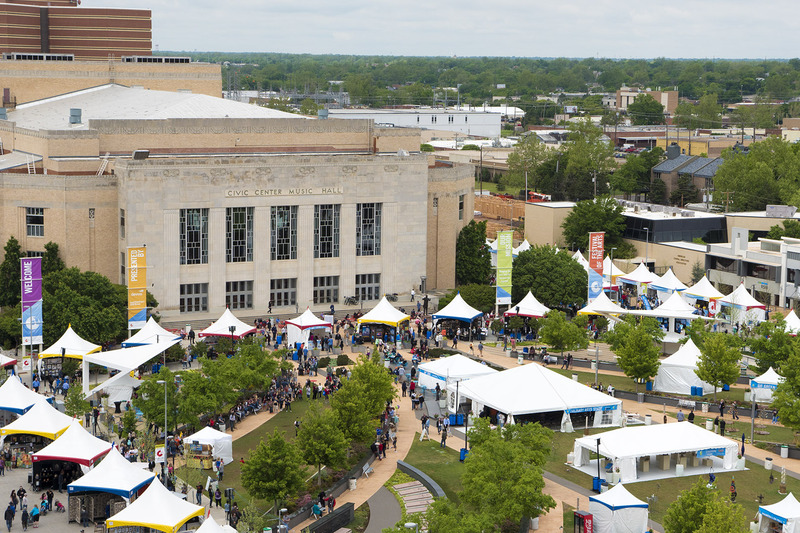 Head there and see all the art for yourself!